How to Get a Rib Cage Tattoo. Getting tattooed on the rib cage is considered one of the most painful spots to get ink. 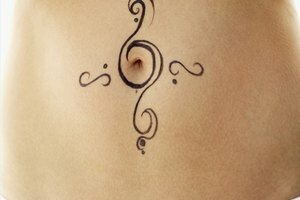 Due to each person's unique size, shape and natural curves, rib cage tattoos can also be more challenging for tattoo artists. 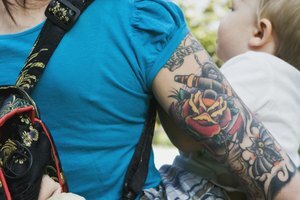 Before getting a tattoo in this sensitive area, be sure you've considered a few key issues first. Consider your pain tolerance. Even ticklish individuals find that rib cage tattoos are no laughing matter. Although some say their rib tattoos didn't hurt any more than tattoos in other areas, a majority of people will tell you that it's a lot more uncomfortable. Decide on placement. The rib cage area offers a pretty large canvas to work with allowing you ample room for larger pieces. Many people will choose to place a design on just one side of their body, but you can also choose something that covers both sides or even incorporate a back piece that works its way around to the ribs on one or both sides. Choose a design. Because you're not limited on space, you can choose detailed pieces that need to be larger for the best effect. Placement may be affected somewhat by the specific design you choose since your tattoo artist will want the piece to flow with your natural curves and valleys, but actual design choices are fairly unlimited. Get into position. A lot of tattoo artists will lay you down to ink your rib cage tattoo, especially if it's a pretty large piece so you and he will be more comfortable throughout the process. But, he should put your stencil on while you're standing to ensure it'll look right in your body's normal position. Don't flinch. Get prepared for a painful experience and be prepared to sit still no matter what. Any time you flinch even slightly, you take the chance that your tattoo artist will make a mistake within your design that he may or may not be able to fix. Don't hold your breath. Remember to keep breathing no matter how much it hurts or else you could find yourself getting really lightheaded and possibly even wind up fainting. Take slow, even breaths and if you do start to feel somewhat woozy, ask your tattoo artist for a break. Take a break if the pain is beginning to get unbearable or you're having a hard time not flinching or fidgeting. Tattoo artists are used to clients needing breaks at different intervals and it's not unusual to need one or even several breaks during a rib cage tattoo. Finish it in sessions. Nobody says you have to finish you're entire rib cage tattoo in one session, especially if it's a large or intricate piece. As long as you can make it through the all important outline, then you can quit whenever you feel you've had enough. Although rib cage tattoos can be extremely painful, they're obviously bearable or so many people wouldn't be sporting one of their own. Wear loose clothing while your rib cage tattoo is healing to avoid as much rubbing or irritation in the tattoo area as possible. Like any tattoo, there may be some pain and swelling following the tattoo procedure. This discomfort may continue for several days, so it's not a bad idea to get your side piece done while you have a few days off from work.